Homework has been a thorn in my side for a long time. While my oldest son, now in high school, attended a private school for pre-k through second grade and wasn’t required to do homework until second grade, my other children who have attended public school only have brought homework home since kindergarten. Kindergarten! Boy, have times changed. I can’t remember being assigned homework until fifth grade myself. Admittedly, that was a long time ago, and much has changed on the educational landscape since I was a kid. This isn’t a public school vs. private school debate, however; the homework problem extends to both sides. 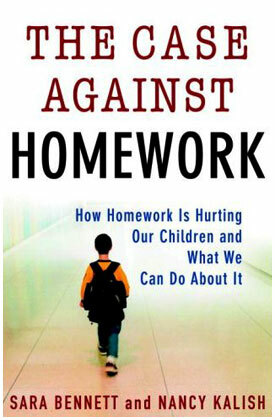 The homework issue has only gotten worse as more of my kids have entered school, and we fight a daily battle over it. In truth, my heart has never been in it, though, and I resent being placed in the role of homework taskmaster when I think it’s ridiculous to require young kids like this (I currently have a first-grader, two third-graders, and a fifth-grader, in addition to my high school sophomore and two younger children who are not yet school age) to do homework in the first place. Studies are also cited which conclude that, despite conventional wisdom, homework does not teach responsibility or self-direction, especially when kids are too young to be developmentally equipped for these skills and, in fact, require a great deal of parental direction and involvement in their homework, and there is little to no correlation between homework and academic achievement, especially in elementary school. Excessive homework (which includes any homework for kids who are not developmentally ready to tackle it after spending all day at school) burns kids out and leads to frustration and a dislike for school, which is directly counter to what homework proponents insist homework accomplishes. Additionally, all those worksheets your kid brings home to do? More than anything, they teach rote learning, and not real thinking. The second half of the book explains how to go about effecting change in your community, on the district level, school level, and classroom level. I am finally fired up enough about this issue to take action, and this book has inspired me to spearhead a campaign for change in my community. I highly recommend this book to all parents of school-aged children. I am buying this book… one for me and one for the principal at my children’s elementary school. My husband and I have already met with them about this issue, and I have blogged about it. Everything you said in that bulleted list is exactly what I am agonizing over.